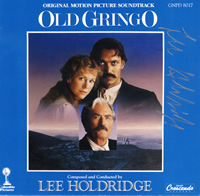 GNP Crescendo Records presents the original motion picture soundtrack to the 1989 Columbia Pictures film OLD GRINGO starring Jane Fonda, Jimmy Smits and the legendary Gregory Peck. When school teacher Harriet Winslow (Jane Fonda) goes to Mexico to teach, she is kidnapped by Gen. Tomas Arroyo (Jimmy Smits) & his revolutionaries. An aging American, Ambrose "Old Gringo" Bierce (Gregory Peck) also in Mexico, befriends Gen. Arroyo & meets Harriet. Bierce is a famous writer, who knowing that he is dying, wishes to keep his identity secret so he can determine his own fate. Though he likes Arroyo, Bierce tries to provoke the General's anger whenever possible in an attempt to get himself killed, thus avoiding suffering through his illness. Winslow is intrigued by both Bierce and Arroyo, and the men are in turn attracted to her. She becomes romantically involved with Arroyo. When Winslow learns of Bierce's true identity (a writer whose work she has loved and respected for years), she is single mindedly determined to fulfill his dying wish. The score was composed by Lee Holdridge, whose credits include THE BEASTMASTER, SPLASH, MR. MOM, BEAUTY AND THE BEAST and many others.